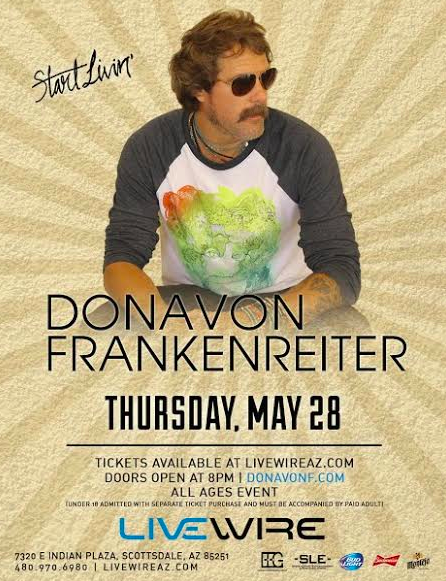 Livewire announces Southern California artist, Donavon Frankenreiter will perform on Thursday, May 28. Doors open at 7 p.m. This is an all-ages event; patrons under 18 must be accompanied by a paid adult. Tickets go on sale Friday, February 13 at Livewireaz.com. Before launching a solo career as the protégé of Jack Johnson, Donavon Frankenreiter began his professional life as a surfer. Born in Southern California, he landed a sponsorship with Billabong as a young teenager and moved to Hawaii at the age of 14. Frankenreiter began to dabble in music at the age of 18 while he played in a group known as Peanut Butter and Jam. In 1996 he wholeheartedly kick started his musical career with the formation of his own 70’s rock inspired band, Sunchild. Disbanding from Sunchild in 2001, Donovan went on to pursue a solo career. In 2002, Frankenreiter signed with Brushfire Records and began recording his first solo album with co-producers and good friends, Jack Johnson and Mario Caldato Jr. In 2004, he released his self-titled album, “Donavon Frankenreiter,” which went on to reach the Top 40 of the Australian Recording Industry Association (ARIA). For more information on Livewire, click here or call 480-970-1112. Livewire is located at 7320 E. Indian Plaza Scottsdale, Ariz. 85251. Keep up-to-date with Livewire by following the latest news on Facebook, Twitter or Instagram.